The World Wide Web (abbreviated as WWW or W3, commonly known as the Web, or the "Information Superhighway"), is a system of interlinked hypertext documents accessed via the Internet. With a web browser, one can view web pages that may contain text, images, videos, and other multimedia, and navigate between them via hyperlinks. Using concepts from his earlier hypertext systems like ENQUIRE, British engineer and computer scientist Sir Tim Berners-Lee, now Director of the World Wide Web Consortium (W3C), wrote a proposal in March 1989 for what would eventually become the World Wide Web. At CERN, a European research organization near Geneva situated on Swiss and French soil, Berners-Lee and Belgian computer scientist Robert Cailliau proposed in 1990 to use hypertext "... to link and access information of various kinds as a web of nodes in which the user can browse at will", and they publicly introduced the project in December. In the May 1970 issue of Popular Science magazine Arthur C. Clarke was reported to have predicted that satellites would one day "bring the accumulated knowledge of the world to your fingertips" using a console that would combine the functionality of the Xerox, telephone, television and a small computer, allowing data transfer and video conferencing around the globe. Clarke also determined that geosyncronous orbit would be possible at the altitude of 22,000 miles, which is why that region is called the Clarke Belt. In March 1989, Tim Berners-Lee wrote a proposal that referenced ENQUIRE, a database and software project he had built in 1980, and described a more elaborate information management system. With help from Robert Cailliau, he published a more formal proposal (on November 12, 1990) to build a "Hypertext project" called "WorldWideWeb" (one word, also "W3") as a "web" of "hypertext documents" to be viewed by "browsers" using a client–server architecture. This proposal estimated that a read-only web would be developed within three months and that it would take six months to achieve "the creation of new links and new material by readers, so that authorship becomes universal" as well as "the automatic notification of a reader when new material of interest to him/her has become available." While the read-only goal was met, accessible authorship of web content took longer to mature, with the wiki concept, blogs, Web 2.0 and RSS/Atom. The proposal was modeled after the Dynatext SGML reader by Electronic Book Technology, a spin-off from the Institute for Research in Information and Scholarship at Brown University. The Dynatext system, licensed by CERN, was technically advanced and was a key player in the extension of SGML ISO 8879:1986 to Hypermedia within HyTime, but it was considered too expensive and had an inappropriate licensing policy for use in the general high energy physics community, namely a fee for each document and each document alteration. A NeXT Computer was used by Berners-Lee as the world's first web server and also to write the first web browser, WorldWideWeb, in 1990. By Christmas 1990, Berners-Lee had built all the tools necessary for a working Web: the first web browser (which was a web editor as well); the first web server; and the first web pages, which described the project itself. On August 6, 1991, he posted a short summary of the World Wide Web project on the alt.hypertext newsgroup. This date also marked the debut of the Web as a publicly available service on the Internet. The first photo on the web was uploaded by Berners-Lee in 1992, an image of the CERN house band Les Horribles Cernettes. Web as a "Side Effect" of the 40 years of Particle Physics Experiments. The first server outside Europe was set up at SLAC to host the SPIRES-HEP database. Accounts differ substantially as to the date of this event. The World Wide Web Consortium says December 1992, whereas SLAC itself claims 1991. This is supported by a W3C document entitled A Little History of the World Wide Web. The crucial underlying concept of hypertext originated with older projects from the 1960s, such as the Hypertext Editing System (HES) at Brown University, Ted Nelson's Project Xanadu, and Douglas Engelbart's oN-Line System (NLS). Both Nelson and Engelbart were in turn inspired by Vannevar Bush's microfilm-based "memex", which was described in the 1945 essay "As We May Think". The World Wide Web had a number of differences from other hypertext systems that were then available. The Web required only unidirectional links rather than bidirectional ones. This made it possible for someone to link to another resource without action by the owner of that resource. It also significantly reduced the difficulty of implementing web servers and browsers (in comparison to earlier systems), but in turn presented the chronic problem of link rot. Unlike predecessors such as HyperCard, the World Wide Web was non-proprietary, making it possible to develop servers and clients independently and to add extensions without licensing restrictions. On April 30, 1993, CERN announced that the World Wide Web would be free to anyone, with no fees due. Coming two months after the announcement that the server implementation of the Gopher protocol was no longer free to use, this produced a rapid shift away from Gopher and towards the Web. An early popular web browser was ViolaWWW for Unix and the X Windowing System. Scholars generally agree that a turning point for the World Wide Web began with the introduction of the Mosaic web browser in 1993, a graphical browser developed by a team at the National Center for Supercomputing Applications at the University of Illinois at Urbana-Champaign (NCSA-UIUC), led by Marc Andreessen. Funding for Mosaic came from the U.S. High-Performance Computing and Communications Initiative and the High Performance Computing and Communication Act of 1991, one of several computing developments initiated by U.S. Senator Al Gore. Prior to the release of Mosaic, graphics were not commonly mixed with text in web pages and the Web's popularity was less than older protocols in use over the Internet, such as Gopher and Wide Area Information Servers (WAIS). Mosaic's graphical user interface allowed the Web to become, by far, the most popular Internet protocol. The World Wide Web Consortium (W3C) was founded by Tim Berners-Lee after he left the European Organization for Nuclear Research (CERN) in October 1994. It was founded at the Massachusetts Institute of Technology Laboratory for Computer Science (MIT/LCS) with support from the Defense Advanced Research Projects Agency (DARPA), which had pioneered the Internet; a year later, a second site was founded at INRIA (a French national computer research lab) with support from the European Commission DG InfSo; and in 1996, a third continental site was created in Japan at Keio University. By the end of 1994, while the total number of websites was still minute compared to present standards, quite a number of notable websites were already active, many of which are the precursors or inspiration for today's most popular services. Connected by the existing Internet, other websites were created around the world, adding international standards for domain names and HTML. Since then, Berners-Lee has played an active role in guiding the development of web standards (such as the markup languages in which web pages are composed), and in recent years has advocated his vision of a Semantic Web. The World Wide Web enabled the spread of information over the Internet through an easy-to-use and flexible format. It thus played an important role in popularizing use of the Internet. Although the two terms are sometimes conflated in popular use, World Wide Web is not synonymous with Internet. The Web is a collection of documents and both client and server software using Internet protocols such as TCP/IP and HTTP. The terms Internet and World Wide Web are often used in everyday speech without much distinction. However, the Internet and the World Wide Web are not one and the same. The Internet is a global system of interconnected computer networks. In contrast, the Web is one of the services that runs on the Internet. It is a collection of text documents and other resources, linked by hyperlinks and URLs, usually accessed by web browsers from web servers. In short, the Web can be thought of as an application "running" on the Internet. Viewing a web page on the World Wide Web normally begins either by typing the URL of the page into a web browser or by following a hyperlink to that page or resource. The web browser then initiates a series of communication messages, behind the scenes, in order to fetch and display it. The web browser parses the HTML, interpreting the markup (<title>, <p> for paragraph, and such) that surrounds the words in order to draw the text on the screen. Many web pages use HTML to reference the URLs of other resources such as images, other embedded media, scripts that affect page behavior, and Cascading Style Sheets that affect page layout. The browser will make additional HTTP requests to the web server for these other Internet media types. As it receives their content from the web server, the browser progressively renders the page onto the screen as specified by its HTML and these additional resources. The hyperlink structure of the WWW is described by the webgraph: the nodes of the webgraph correspond to the web pages (or URLs) the directed edges between them to the hyperlinks. Over time, many web resources pointed to by hyperlinks disappear, relocate, or are replaced with different content. This makes hyperlinks obsolete, a phenomenon referred to in some circles as link rot and the hyperlinks affected by it are often called dead links. The ephemeral nature of the Web has prompted many efforts to archive web sites. The Internet Archive, active since 1996, is one of the best-known efforts. Many domain names used for the World Wide Web begin with www because of the long-standing practice of naming Internet hosts (servers) according to the services they provide. The hostname for a web server is often www, in the same way that it may be ftp for an FTP server, and news or nntp for a USENET news server. These host names appear as Domain Name System or (DNS) subdomain names. The use of 'www' as a subdomain name is not required by any technical or policy standard; indeed, the first ever web server was called nxoc01.cern.ch, and many web sites exist without it. 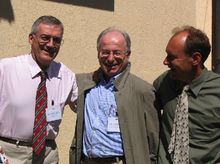 According to Paolo Palazzi, who worked at CERN along with Tim Berners-Lee, the popular use of 'www' subdomain was accidental; the World Wide Web project was intended to be the CERN home page, however the dns records were never switched, and the practice of prepending 'www' to an institution's website domain name was subsequently copied. Many established websites still use 'www', or they invent other subdomain names such as 'www2', 'secure', etc. Many such web servers are set up such that both the domain root (e.g., example.com) and the www subdomain refer to the same site; others require one form or the other, or they may map to different web sites. The use of a subdomain name is useful for load balancing incoming web traffic by creating a CNAME record that points to a cluster of web servers. Since, currently, only a subdomain can be used in a CNAME, the same result cannot be achieved by using the bare domain root. When a user submits an incomplete domain name to a web browser in its address bar input field, some web browsers automatically try adding the prefix "www" to the beginning of it and possibly ".com", ".org" and ".net" at the end, depending on what might be missing. For example, entering 'microsoft' may be transformed and 'openoffice'. This feature started appearing in early versions of Mozilla Firefox, when it still had the working title 'Firebird' in early 2003, from an earlier practice in browsers such as Lynx. It is reported that Microsoft was granted a US patent for the same idea in 2008, but only for mobile devices. In English, www is pronounced by individually pronouncing the name of characters (double-u double-u double-u) or by saying the phrase "triple double-u". Although some technical users pronounce it dub-dub-dub, this is not widespread (although is commonly used by the general public in New Zealand). The English writer Douglas Adams once quipped in The Independent on Sunday (1999): "The World Wide Web is the only thing I know of whose shortened form takes three times longer to say than what it's short for," with Stephen Fry later pronouncing it in his "Podgrammes" series of podcasts as "wuh wuh wuh." In Mandarin Chinese, World Wide Web is commonly translated via a phono-semantic matching to wàn wéi wǎng (万维网), which satisfies www and literally means "myriad dimensional net", a translation that very appropriately reflects the design concept and proliferation of the World Wide Web. Tim Berners-Lee's web-space states that World Wide Web is officially spelled as three separate words, each capitalized, with no intervening hyphens. Use of the www prefix is declining as Web 2.0 web applications seek to brand their domain names and make them easily pronounceable. As the mobile web grows in popularity, services like Gmail.com, MySpace.com, Facebook.com and Twitter.com are most often discussed without adding the www to the domain (or the .com). The scheme specifiers (http:// or https://) in URIs refer to the Hypertext Transfer Protocol and to HTTP Secure, respectively, and so define the communication protocol to be used for the request and response. The HTTP protocol is fundamental to the operation of the World Wide Web; the added encryption layer in HTTPS is essential when confidential information such as passwords or banking information are to be exchanged over the public Internet. Web browsers usually prepend the scheme to URLs too, if omitted. The primary function of a web server is to deliver web pages on the request to clients. This means delivery of HTML documents and any additional content that may be included by a document, such as images, style sheets and scripts. It is possible that average computer users who use the World Wide Web mainly for things like entertainment may have surrendered their right to privacy in exchange for using a number of services available on the World Wide Web. For example: more than half a billion people worldwide have used a social network service, and of the generations of people within the United States who have had access to the internet from a young age, half have some form of Social Networking presence. and are part of a generational shift that could be changing norms. The social network Facebook progressed from U.S. college students to a 70% non-U.S. audience, but in 2009 estimated that only 20% of its members use privacy settings. In 2010 (six years after co-founding the company), Mark Zuckerberg wrote, "we will add privacy controls that are much simpler to use". Privacy representatives from 60 countries have resolved to ask for laws to complement industry self-regulation, for education for children and other minors who use the Web, and for default protections for users of social networks. They also believe data protection for personally identifiable information benefits business more than the sale of that information. Users can opt-in to features in browsers to clear their personal histories locally and block some cookies and advertising networks but they are still tracked in websites' server logs, and in particular web beacons. Berners-Lee and colleagues see hope in accountability and appropriate use achieved by extending the Web's architecture to policy awareness, perhaps with audit logging, reasoners and appliances. In exchange for providing free content, vendors hire advertisers who spy on Web users and base their business model on tracking them. Since 2009, they buy and sell consumer data on exchanges (lacking a few details that could make it possible to de-anonymize, or identify an individual). Hundreds of millions of times per day, Lotame Solutions captures what users are typing in real time, and sends that text to OpenAmplify who then tries to determine, to quote a writer at The Wall Street Journal, "what topics are being discussed, how the author feels about those topics, and what the person is going to do about them". Microsoft backed away in 2008 from its plans for strong privacy features in Internet Explorer, leaving its users (50% of the world's Web users) open to advertisers who may make assumptions about them based on only one click when they visit a website. Among services paid for by advertising, Yahoo! could collect the most data about users of commercial websites, about 2,500 bits of information per month about each typical user of its site and its affiliated advertising network sites. Yahoo! was followed by MySpace with about half that potential and then by AOL–TimeWarner, Google, Facebook, Microsoft, and eBay. Proposed solutions vary to extremes. Large security vendors like McAfee already design governance and compliance suites to meet post-9/11 regulations, and some, like Finjan have recommended active real-time inspection of code and all content regardless of its source. Some have argued that for enterprise to see security as a business opportunity rather than a cost center, "ubiquitous, always-on digital rights management" enforced in the infrastructure by a handful of organizations must replace the hundreds of companies that today secure data and networks. Jonathan Zittrain has said users sharing responsibility for computing safety is far preferable to locking down the Internet. Many formal standards and other technical specifications and software define the operation of different aspects of the World Wide Web, the Internet, and computer information exchange. 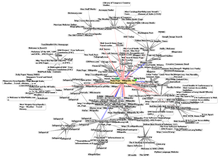 Many of the documents are the work of the World Wide Web Consortium (W3C), headed by Berners-Lee, but some are produced by the Internet Engineering Task Force (IETF) and other organizations. Access to the Web is for everyone regardless of disability—including visual, auditory, physical, speech, cognitive, and neurological. Accessibility features also help others with temporary disabilities like a broken arm or the aging population as their abilities change. The Web is used for receiving information as well as providing information and interacting with society, making it essential that the Web be accessible in order to provide equal access and equal opportunity to people with disabilities. Tim Berners-Lee once noted, "The power of the Web is in its universality. Access by everyone regardless of disability is an essential aspect." Many countries regulate web accessibility as a requirement for websites. International cooperation in the W3C Web Accessibility Initiative led to simple guidelines that web content authors as well as software developers can use to make the Web accessible to persons who may or may not be using assistive technology. The W3C Internationalization Activity assures that web technology will work in all languages, scripts, and cultures. Beginning in 2004 or 2005, Unicode gained ground and eventually in December 2007 surpassed both ASCII and Western European as the Web's most frequently used character encoding. Originally RFC 3986 allowed resources to be identified by URI in a subset of US-ASCII. RFC 3987 allows more characters—any character in the Universal Character Set—and now a resource can be identified by IRI in any language. Between 2005 and 2010, the number of Web users doubled, and was expected to surpass two billion in 2010. Early studies in 1998 and 1999 estimating the size of the web using capture/recapture methods showed that the much of the web was not indexed by search engines and the web was much larger than expected. According to a 2001 study, there were a massive number, over 550 billion, of documents on the Web, mostly in the invisible Web, or Deep Web. A 2002 survey of 2,024 million Web pages determined that by far the most Web content was in English: 56.4%; next were pages in German (7.7%), French (5.6%), and Japanese (4.9%). A more recent study, which used Web searches in 75 different languages to sample the Web, determined that there were over 11.5 billion Web pages in the publicly indexable Web as of the end of January 2005. As of March 2009, the indexable web contains at least 25.21 billion pages. On July 25, 2008, Google software engineers Jesse Alpert and Nissan Hajaj announced that Google Search had discovered one trillion unique URLs. As of May 2009, over 109.5 million domains operated Of these 74% were commercial or other sites operating in the .com generic top-level domain. Statistics measuring a website's popularity are usually based either on the number of page views or on associated server 'hits' (file requests) that it receives. There are other components of the Internet that can cache Web content. Corporate and academic firewalls often cache Web resources requested by one user for the benefit of all. (See also Caching proxy server.) Some search engines also store cached content from websites. Apart from the facilities built into Web servers that can determine when files have been updated and so need to be re-sent, designers of dynamically generated Web pages can control the HTTP headers sent back to requesting users, so that transient or sensitive pages are not cached. Internet banking and news sites frequently use this facility. Data requested with an HTTP 'GET' is likely to be cached if other conditions are met; data obtained in response to a 'POST' is assumed to depend on the data that was POSTed and so is not cached.